There's something disappointing about players; no matter how much you tell them a game is good and fun, they don't always give it a try, or just give it a chance to prove itself. Instead, they go to buy the latest instalment of their favorite series, thinking there can't be anything better than this, forgetting they haven't tried anything but this. I don't mean they are always wrong; many people bought Resident Evil without trying Eternal Darkness, still they chose a great game. Same thing with Tony Hawk 4. It's good. But there's Aggressive Inline. And Aggressive Inline somehow proposed a different experience, inline skating, and lots of fun, much before Hawk the 4th was elected extreme sport of the year. So, what could we now say to make YOU interested in Aggressive Inline ? 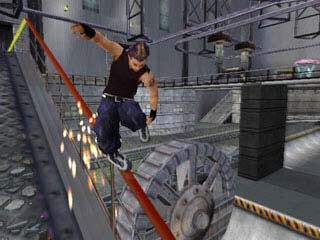 YOU, who maybe bought Pro Skater 4 but didn't try Aggressive Inline, YOU, who maybe just hates extreme sports. Can't say more than the truth: Aggressive Inline is sheer good fun and great freedom. It's all about speed, jump, figures, humour and exploration. You visit 7 huge levels full of things to see and to do; things like challenges, sometimes given to you by a character for some weird and humorous reason; you have to pass them in order to move forward in the game and access new levels and secrets. Some are tough, they will require good skating skills. That's fine, because Aggressive Inline uses a very unique experience points system to improve your skater abilities, just like in a RPG, the more you do the better your character becomes. A juice gauge gives you the energy to perform your tricks, no time limit, you can skate as long as you have juice; and if you skate well enough, it's not going to empty ! Aggressive Inline is really packed with options and fun, it's a long way to complete 100% of a level and if you get tired of it, you can play with a friend or build your own park. It ensures hours of fun, and if you're not Bill Gates' son, you might prefer to spend your doughs in a long lasting game. 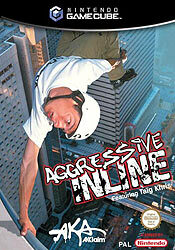 Aggressive Inline is technically much better than Dave Mirra 2, graphics, sounds and animations are greatly improved. There are also more musics, though 13 is still not enough. However, compared to other GameCube titles and after playing it for a few hours, the game feels less and less polished. Never mind ! Aggressive Inline rocks. Even if you don't care about extreme sports you might love it, because it simply has everything a great game should have. "- Features the top pros in the industry like 2001 Gravity Games and X Games Vert Champion Taïg Khris, 2001 X Games Street Champion Jaren Grob, the founding father of Inline Skating, Chris Edwards in additon to Franky Morales, Shane Yost, Matt Lindenmuth, Eito Yasutoko, Sven Boekhorst, Matt Salerno and Sam Fogarty. We have the best of the best in Inline Skating. - Introducing the innovative "Juice Meter" Timed levels are a thing of the past, now if you perform a trick your juice meter will raise and you'll be able to continue on, if you can't perform your juice meter will run out and it's Game Over. - Aggressive Inline introduces the "Action Button" The one touch button for all your skitching, pole grabbing, vaulting and interactive needs. This really increases the interactively of each environment for all skill levels. - 30 to 60 objectives per level with challenges including time limit point total, Head-to-Head, single trick point value, NPC challenges and many others. - 10 to 15 cinematic events per level that makes the worlds really come alive. As an example, if you skate off of the Atlas statue, the massive globe rolls on to the street smashing two buses that form into a half pipe. - Integrated Park Editor within main game levels allowing player to build terrain in order to accomplish objectives. 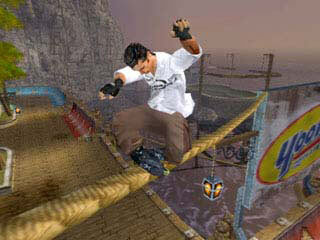 - Over-the-top tricks never seen before in an action sport's game. Six types of manuals, grind transitions, double leg grind, new big air tricks, wall taps, stalls, wall flips, hand plants and much more. - 7 huge levels offering a plethora of rails, ramps, pipes and surprises. - Multiplayer: Insane, lightning-quick, split-screen mutiplayer games. - Incredible soundtrack from bands such as: Hoobastank, Black Sheep, Pharcyde, Reel Big Fish, Sublime and more!"